Per had been interviewed by Jan Gradvall for his Swedish Radio podcast and the program was made available last Saturday. You can listen to it or even download it from HERE. Per’s part starts at 7:18 and ends at 21:50. The second half of the program is an interview with Kajsa Grytt. The topic was “I Want You”, a song title that you can find among The Beatles, Bob Dylan and Elvis Costello classic songs, but Jan and Per also went into a deep analysis of song titles in general. Per’s opinion about Bob Dylan’s “I Want You” is that it’s an awesome song on Dylan’s fantastic Blonde on Blonde album. It was released in 1966 when Per was 7 years old, so he says he didn’t know what the song “I Want You” was about, but he remembers he listened to it a lot of times. 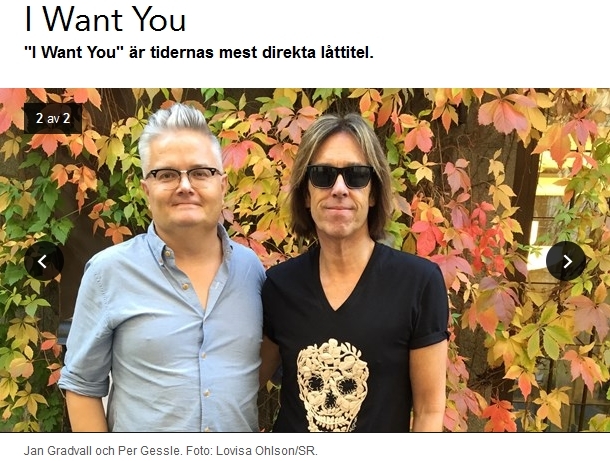 According to Per, “I Want You” is a very good, simple and direct title. It makes you curious. Gradvall asked him what makes a song title a good song title. Per says, even if today’s generation doesn’t really look at album covers, actually it’s usually the title of the song you see first. It has to raise curiosity about what the song is about. He thinks a good title is very important, but it’s also a matter of taste. He likes simple titles, but he also likes strange titles, e.g. of his GT songs ”Allt jag lärt mig i livet har jag lärt mig av Vera” or ”(Dansar inte lika bra som) Sjömän”. Per thinks many artists have boring song titles. Jan asked Mr. G what he thinks, which his best song titles are. Per says “Dressed For Succes” is really good, “Ska vi älska, så ska vi älska till Buddy Holly” is very good, “Sleeping In My Car”, “How Do You Do!”, because it makes you curious what the song is about, “Queen Of Rain” is an exciting title, “Crash! Boom! Bang!” which is coming from Elvis Presley’s Jailhouse Rock [here he is singing the tunes 🙂 ], “Flickorna på TV2” is a superb title. They talk about Elvis Costello as well. Per likes him and liked his first album and the song “Watching the Detectives”. He thinks he became a little bit too clever with a little bit too many chords for Per, but he is a fantastic musician and singer. He listened more to Costello’s producer, Nick Lowe. Per prefers simplicity and beautiful, simple melodies. “I Want You (She’s So Heavy)” by The Beatles is very simple and direct. Per thinks it’s a fantastic mix and it’s an odd, but a damn good song on “Abbey Road”. The album came out when Per was 10 and it was an important one for him. “Come Together” is also an outstanding song on it. George Harrison’s “Something” and “Here Comes The Sun” are masterpieces on “Abbey Road”. “Octopus’s Garden” and Paul’s medley on side two are also fantastic. Per explains he did a medley on his “Son of a Plumber” album, the “Junior Suite” and it was inspired by the “Abbey Road” medley. It was real fun doing it. Gradvall asked Per about his thoughts on The Beatles song titles. The early songs had more simple titles (“I Should Have Known Better”, “I’ll Cry Instead”, “Love Me Do”, “Please Please Me”), but later the titles became more nonsense and abstract, e.g. “Happiness Is A Warm Gun”, “Tomorrow Never Knows”, “Sgt. Pepper’s Lonely Hearts Club Band”, “Lucy in the Sky with Diamonds”. If he looks back at Lennon titles, they were rather simple, e.g. “It’s So Hard”, “Jealous Guy”, “Imagine”, “God”. Jan asked Per about his own “I Want You”. Mr. G clarifies it’s not his own song, he did it together with Marie Fredriksson, Eva Dahlgren and the Ratata guys in 1987, during their joint tour Rock runt riket. The producer was Anders Glenmark and it does sound like a Glenmarkish song. To the question how many words are optimal in a song title Per replied sometimes he thinks as many as possible. For example, for the latest Gyllene Tider album he wrote a song with a long title “Jag tänker åka på en lång lång lång lång lång resa”. It could have been “Jag tänker åka på en lång resa”, but with 5 långs it sounds better and it is to emphasize how long the journey is. It’s that “The Continuing Story Of Bungalow Bill” is much better than “Bungalow Bill”. Or as an album title, “The Rise and Fall of Ziggy Stardust and the Spiders from Mars” is much better than “Ziggy Stardust”. But a song title can be short or long, the important thing is to raise curiosity. It can be a question that might not be answered in the song or e.g. he has the title “I Never Quite Got Over The Fact That The Beatles Broke Up” which is not in the lyrics, but the content reflects that he didn’t get over the fact.